SPSS - How to fix “Your license will expire in ... days”? SPSS – How to fix “Your license will expire in … days”? You are here: Home Blog June 2017 SPSS – How to fix “Your license will expire in … days”? I'm a pretty happy SPSS user but since a while, the software has been telling me that “Your license will expire in ... days.” I had already extended my license with another year but -apparently- SPSS seemed to be oblivious to that. It took me some trial and error to troubleshoot the issue. Since I'm running this website anyway, I thought I may just as well share my solution. Note: before you start, close SPSS entirely. After extending my license, I received a bunch of emails from IBM and one of them contained an authorization code denoted as “AuthCode” as shown below. If you really can't find it, you can get one from the IBM website (if you're a licensed user of course). I should add that actually getting things done here may be a long and tedious process -in my experience at least. 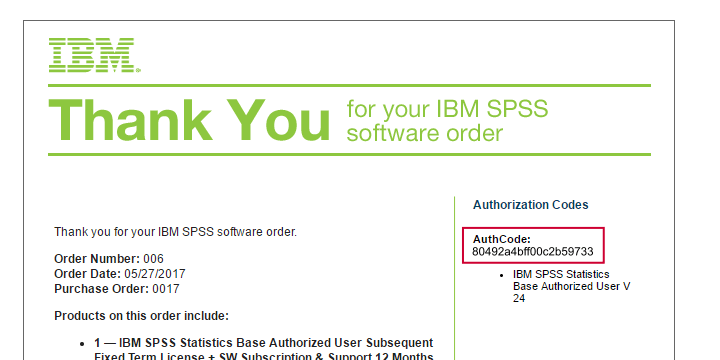 With your authorization code nearby, open up the SPSS installation folder. For recent versions it may be something like C:\Program Files\IBM\SPSS\Statistics\24 in this folder you'll find a tiny program called law.exe as shown below. At first I thought this referred to something legal (“law” as in “breaking the law”). Then I learned that “law” is short for “License Authorization Wizard”. Let's run it, for instance by double clicking it. Most of the following steps are rather straightforward as shown below. I must confess that I found the next step (below) somewhat confusing. However, I just entered the authorization code here, clicked Next and proceeded. Well, that did the job for me. In order to really make sure everything's ok, I'll propose a quick final check below. At this point, you can start SPSS and open a new syntax editor window. Copy-paste show license. into it and run it. The resulting table in the output viewer window should now confirm that you're good to go.